How many flights will arrive to a particular airport? Click here to find out. 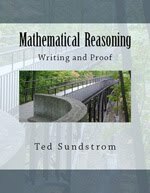 Mathematical Reasoning: Writing and Proof is a text for the first college mathematics course that introduces students to the processes of constructing and writing proofs and focuses on the formal development of mathematics. The primary goals of the text are to help students: Develop logical thinking skills and to develop the ability to think more abstractly in a proof oriented setting. Develop the ability to construct and write mathematical proofs using standard methods of mathematical proof including direct proofs, proof by contradiction, mathematical induction, case analysis, and counterexamples. Develop the ability to read and understand written mathematical proofs. Develop talents for creative thinking and problem solving. Improve their quality of communication in mathematics. This includes improving writing techniques, reading comprehension, and oral communication in mathematics. etter understand the nature of mathematics and its language. Another important goal of this text is to provide students with material that will be needed for their further study of mathematics. Important features of the book include: Emphasis on writing in mathematics nstruction in the process of constructing proofs Emphasis on active learning. Includes material needed for further study in mathematics. Richard Hammack is an associate professor of mathematics at Virginia Commonwealth University in Richmond, Virginia. A native of rural southern Virginia, he studied painting at Rhode Island School of Design before an interest in computer graphics and visualization led him to mathematics. He works mostly in the areas of combinatorics and graph theory. Mathematical Logic - Set Theory, Model Theory, Proof Theory, Computability, etc.